← Mini-Editorial: When is a game truly completed? 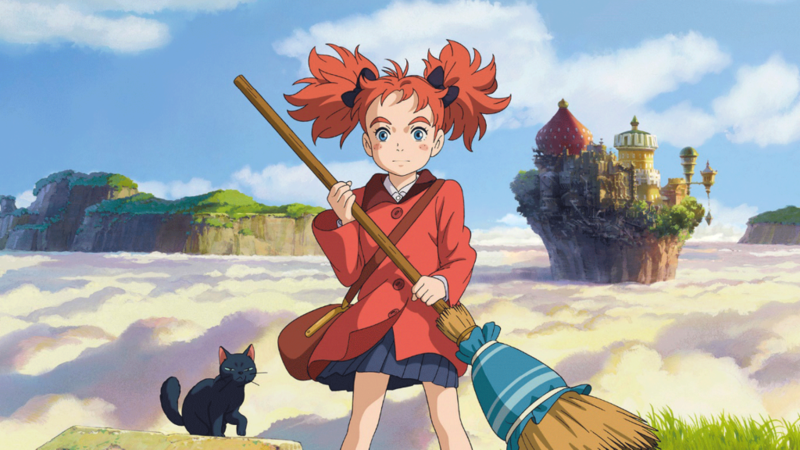 Mary and the Witch’s Flower is the first film from Studio Ponoc, a breakaway from Studio Ghibli. With that in mind, it’s no wonder that the film looks and feels very much like a Ghibli title. It’s based on The Little Broomstick by British author Mary Stewart, a novel which sounds like it should be a classic that every English-speaking child has read, but which I’ve actually never encountered before. Mary Smith has been sent to spend her summer holidays in the middle of the countryside with her great aunt Charlotte. With little to do and barely anyone her own age to interact with, Mary is bored out of her mind – at least until a pair of cats lead her deep into the woods. There, Mary discovers an enchanted broomstick and a flower that can bestow her with magical powers, and before she knows it, she’s whisked off to the magical college of Endor. But whilst Mary initially laps up the attention her temporary magical powers bring, she later discovers that Endor’s senior staff have dark plans, and that they will stop at nothing at retrieving the magical flowers. Mary and the Witch’s Flower is a great family film, and a delightful experience all round. Naturally, with all that Ghibli talent behind it, the aesthetic is gorgeous – a brightly coloured magical world brought to life by excellent voice acting and catchy music. The story is well paced and absorbing, and at no point did I feel bored or detached from the events on screen – even the obligatory “final boss battle” was mercifully swift. I also enjoyed the film’s subversion of “normal kid goes to magic school” tropes. Yes, the faculty are initially convinced that Mary is a once-in-a-lifetime prodigy, but actually she’s just a normal girl who happened to stumble across some temporary magical powers. In fact, her very human reactions to this turn of events make her much more likeable than if she had actually been a destined hero with special abilities. And Endor itself isn’t a cheery wish fulfilment magical school – there’s actually some pretty sinister stuff going on behind the scenes. To use the most obvious analogy, it’s as if Harry Potter had lied about his magical powers to get into Hogwarts, only to discover that Dumbledore and McGonagall were carrying out horrific Transfiguration experiments. As to be expected from a two-hour movie, there isn’t the time for masses of character development, with everyone other than Mary herself being rather one-dimensional. There’s even a bit of jarring moment where Mary’s friend (of sorts) Peter suddenly starts going on about how he wishes he could be a grown-up so he could be of help to his mother. It’s presumably meant to be an attempt to provide depth and backstory, but the way it’s just thrown in as an offhand remark does make it feel a bit forced and cheap. And of course, there’s the twist everyone saw coming, in which one of the more bland characters turns out to be more than they seem, conveniently enabling them to provide advice and support to the main character before the final confrontation. All that being said, however, a special mention must be made of Tib, the black cat who acts as Mary’s companion and familiar of sorts throughout the film. Tib’s reactions to events are always quintessentially feline and a delight to see – he definitely steals the show on more than one occasion. Mary and the Witch’s Flower is a fun film, and I had a great time watching it. It’s a delightful piece of animation for viewers of any age. This entry was posted in OVA and movie. Bookmark the permalink.